Processing will continue on two orbiters through the Christmas holidays, with work required on both Discovery and Endeavour. Meanwhile, a huge crane has been built up to support the final construction of the 600ft Ares I lightning protection towers at Pad 39B. The bulk of the workforce at the Kennedy Space Center (KSC) belong to contractor United Space Alliance (USA), with their holiday set to begin next Wednesday, through to January 1. NASA workers only get Christmas Day and New Years Day off – added to the bonus day off of December 26 – as paid holidays, although most workers book the Christmas period off as a holiday. However, around 100 engineers will be on site, working on Endeavour and Discovery. Work will focus mainly on Discovery, as she presses ahead towards the January 7 rollover target. In preparation for her short trip to the Vehicle Assembly Building (VAB), engineers will replace some TPS (Thermal Protection System) tiles on the crew hatch. “The team is replacing some tiles on the crew hatch,” noted processing information on the latest Shuttle Stand-up/Integration report on L2. “These were removed yesterday and replacement work will continue through the Holiday period. Managers are also proceeding towards the Flight Readiness Review (FRR) stage of the mission, with the dates set for the key SSP (Space Shuttle Program) and Agency level FRRs. The SSP FRR for STS-119 will be conducted on January 21-22. The NASA-HQ Level I FRR – which sets the launch date – will be held on February 3. On Endeavour, a week after her arrival back at KSC, following her ferry trip back from California, a large amount of processing work is taking place. Post flight – and post ferry – operations involve the removal of her tailcone that surrounds her aft, along with work to remove the “Leonardo” Multi-Purpose Logistics Module (MPLM) from her payload bay. Flow control valve x-rays have also started, along with preparations for the removal of Fuel Cell 2, which is to be performed on Saturday. “Preparing for removal of flow control valve from OV-105 this weekend and will ship it to the vendor early next week,” noted the stand-up report, which also added that work on the KU band system – which proved to be troublesome during docking – has also begun. Removal of Endeavour’s three SSMEs (Space Shuttle Main Engines) will pick up over the holiday period, marking the end of the majority of post STS-126 operations, as the orbiter is prepared for her STS-127 mission in June. Work out at Pad 39B continues to press ahead with operations for the first flight of the Ares I launch vehicle – notably via the construction of the three 600 feet tall lightning protection towers. Ivey Construction of Merritt Island, Florida are the contractor for the $28 million project that will oversee the construction of the giant towers, which are already rising out of the ground around Pad 39B, with the next stage set to begin shortly. That was marked by the arrival of a giant crane at the pad, which is so tall it has the ability to reach as high as the top of the VAB. (See L2 over 100 hi res images of Pad 39B’s modifications since 2007 and the blueprints to the towers). While not the biggest crane in the world, the Manitowoc 21000 will easily aid the finalization of the three towers that will protect Ares I from direct lightning strikes (click here for the crane’s product guide). 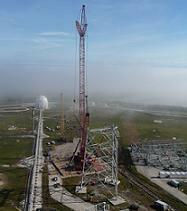 The crane likely to remain in use at Pad 39B for around four months, at a cost of around one million dollars per month. 2009 will also mark the opening work on the biggest modification to Pad 39B, the construction of a huge rollercoaster that will become the Emergency Egress System (EES) for astronauts and pad crew, in the event of a major problem with the Ares I vehicle at the pad. No fixed date has yet been given for the construction of the rollercoaster, which will take several years to build, with design work still taking place at contractor RS&H, on a project that also involves Disney engineers. Meanwhile, over in High Bay 4 (HB4) of the VAB, preparations for the Ares I-X test flight continue, with the mating of Interstage #2 to Interstage #1. This operation will wrap up Ares I-X activities until after the holiday. 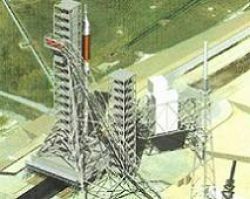 The launch date for Ares I-X – currently slated for July, but could slip to October – will become clearer next month, following the decision on the STS-400 pad options in support of May’s STS-125 mission to service the Hubble Space Telescope. Should Endeavour (STS-400) require 39B, Ares I-X will be delayed.